Location of Sadorus in Champaign County, Illinois. Sadorus is a village in Champaign County, Illinois, United States. The population was 422 at the 2014 census, with 56.6% male, and 43.4% female. Sadorus was the first town founded in Champaign County. Sadorus is located at 39°57′59″N 88°20′43″W﻿ / ﻿39.96639°N 88.34528°W﻿ / 39.96639; -88.34528 (39.966397, -88.345247). According to the 2010 census, Sadorus has a total area of 1.03 square miles (2.67 km2), all land. Sadorus was settled in April 1824 by Henry Sadorus, and was the first town founded in Champaign County. There was a train wreck as a train was passing through the town on February 21, 2011. Two grain cars tipped over and another 3 or 4 cars derailed into a nearby field. The train had already passed through the residential area of the town when it derailed, and so luckily, nobody was injured. It is believed that soggy soil underneath the tracks caused the derailment. At the 2000 census, there were 426 people, 163 households and 118 families residing in the village. The population density was 503.8 per square mile (193.5/km²). There were 169 housing units at an average density of 199.9 per square mile (76.8/km²). The racial makeup of the village was 98.12% White, 0.23% Native American, and 1.64% from two or more races. There were 163 households of which 31.3% had children under the age of 18 living with them, 60.1% were married couples living together, 8.6% had a female householder with no husband present, and 27.6% were non-families. 20.9% of all households were made up of individuals and 6.7% had someone living alone who was 65 years of age or older. The average household size was 2.61 and the average family size was 3.06. 24.4% of the population were under the age of 18, 7.5% from 18 to 24, 35.9% from 25 to 44, 20.9% from 45 to 64, and 11.3% who were 65 years of age or older. The median age was 37 years. For every 100 females, there were 126.6 males. For every 100 females age 18 and over, there were 120.5 males. The median household income was $44,375 and the median family income was $42,083. Males had a median income of $35,167 versus $20,500 for females. The per capita income for the village was $18,540. About 1.7% of families and 3.6% of the population were below the poverty line, including 4.7% of those under age 18 and none of those age 65 or over. Sadorus Rock is a large rock that was in a local field. The rock was moved from the field to in front of the Sadorus Park around 2003. Formally known as "Pioneer Rock", it was renamed "Sadorus Rock" and dedicated to Henry Sadorus on October 30, 1932. It is believed that the large rock wound up in the relatively un-rocky fields of Champaign county sometime during the end of the last ice age when melting glaciers deposited the rock in the area. 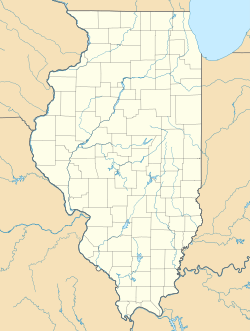 Wikimedia Commons has media related to Sadorus, Illinois. ^ a b "Sadorus, IL Data". city-data.com. United States Census Bureau. Retrieved 2017-10-16. ^ "Sadorus Homepage". 2009. Retrieved 2017-10-16. ^ "History of Sadorus". Retrieved 2017-10-16. ^ "Train Derailment In Champaign County". 2011-02-22. Retrieved 2017-10-16. ^ Kacich, Tom (2016-06-24). "Tom's #Mailbag, June 24, 2016". Retrieved 2017-10-16. This page was last edited on 6 May 2018, at 22:28 (UTC).